A young woman of Chinese descent, raised in Canada, spending time in Los Angeles, found dead in a water tank on the roof of a notorious hotel. 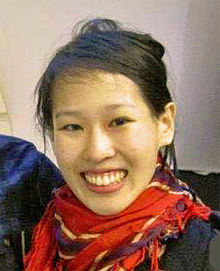 There is a reason to think that Elisa Lam’s mystery would gather international attention. Lam, a 21-year-old Chinese-Canadian, was found face-up in a rooftop water tank atop the Hotel Cecil in downtown Los Angeles in February 2013, and how she got there and how she died is still a mystery, despite a thorough investigation and even the viral elevator video featuring Lam inside the hotel. How did Elisa get into the tank in the first place? Elisa would have had to climb out the window of her room, up the fire escape, then up a ladder to the top of the tank (which was about eight feet high), then lift the 20-pound lid, climb in, then close the lid behind her. Not to mention, she was found naked in the tank. What was going on in the elevator video? Elisa has captivated many with the elevator surveillance video, which the Los Angeles Police Department (LAPD) released to the public just days after Elisa’s body was found. Known to have bipolar disorder and depression, Elisa was seen to be acting oddly in the video, cowering in the corner of the elevator at one point, and at another point seeming to be talking to someone in the hallway – though there was no other person seen. Was she having an episode, or was she really talking to someone who just happened to be outside of camera view? Was there drugs or alcohol involved? This question is only partially settled in that the official toxicology report showed that there was no drugs or alcohol in Elisa’s system. However, does that mean the three or four known medications she was supposedly taken were not in her system either? Actually, we’re not sure of that because there was no report of blood work done on Elisa’ body, which would have confirmed the existence of these medications as well as any other foreign substances. And no, the body showed no signs of trauma that might have suggested a homicide, and there seemed to be no real evidence that Elisa died as a suicide attempt (the Hotel Cecil has a reputation, but all those suicides were executed by jumping off the building, not drowning in the tank). Elisa’s personal effects and some of her clothing was found floating next to her in the water, and her body was only found after maintenance crews responded to guest complaints about low water pressure and/or muddy water. The real tragedy here is that Elisa’s family, especially her parents back in Vancouver, British Columbia, has many of the same unanswered questions, and also does not have the closure that they would need to understand what happened to their girl. It is a death that has inspired episodes of shows and even short films – which makes sense since it was right in the backyard of Hollywood. Elisa Lam’s death is truly an L.A. Confidential. Previous Previous post: The Sodder Children: Fire Or Mafia Statement?